Lived in Hubbard during this storm; easily one of the most scary parts of my life. I was 9 years old at the time. That storm started a life-long fasination of severe weather. I remember my cousin talking about the devastation. Their house was destroyed, as was the house across the street (and the pond was filled with debris), but the houses on either side survived with (in his words) "minimal damage." (granted, he might have had a different definition of "minimal" after losing his own home to an F5). One mildly amusing anecdote: In frustration, he smashed his camera against a tree. The insurance adjuster later commented "Man, the storm sure did a number on that camera." I was looking at the track and the far east end is about .5 miles to far north. Not that it really matters. I know that the track crossed the intersection of Bend Road and PA Route 318. I rode my bicycle through there the next day and knew the persons house who used to be there. Shot from Niles facing South-Southwest. Incredible photo. 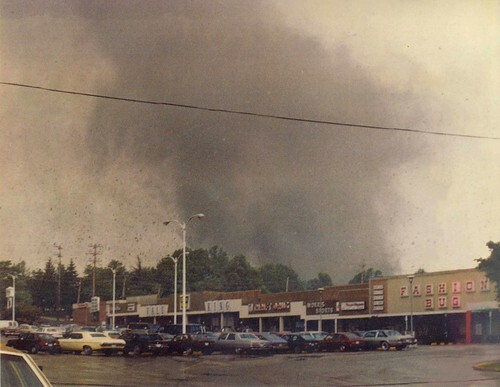 I remember driving through Niles when it hit and it must have split because it passed it front of us out of view and we came upon the damage left in its wake. Had to turn around and go back the way we came and it was blocked with damage also. Never did actually see the tornado live. A 75,000 pound oil storage tank that was torn loose and dropped onto a road in Niles. The tornado as it tore through Wheatland. Despite being an F5 with 300mph winds, it was never more than 150-200 yards wide. The Destroyed WWIZ Radio Station in Greenfeild Township, east of Hermitage. Niles Park Plaza, where several deaths occured. Destroyed homes in Newton Falls. Vice President Bush touring the damage at Wheatland.